“No one should cross the limit” announced Bangladesh’s Inspector General of Police earlier this month. In the wake of the murder of Niloy Neel, the fourth secularist Bangladeshi blogger to be hacked to death this year, this may seem both an attempt to close the stable door on escalating fundamentalist violence after it has already bolted, and a wilful understatement given the horrific severity and increasing incidence of such attacks. But astonishingly, the senior officer was not sanctioning the perpetrators of the attacks, but rather warning activists to censor themselves if they want to avoid being placed on one of several hit lists – the likes of which have already proven fatal for Neel and three others this year alone. This barely tacit official justification for fatally attacking and maiming people for expressing their views is a stark indication of both the source and scale of the problem currently being faced in Bangladesh. Global Minorities Alliance has joined hands with the International Humanist and Ethical Union, signing an open letter to the Bangladeshi Prime Minister and president calling on them to condemn this victim blaming narrative. The government and constitution of the Muslim majority country are ostensibly secular, and have been since Bangladesh’s hard-won independence from Pakistan in 1971. However, activists such as Imran Sarker have accused those currently in power of channelling more energy into the hounding of secularists in the name of ‘defending Islam’, than reining in groups such as the militant Ansarullah Bangla Team who have claimed responsibility for the horrific attacks. This flaccid commitment to the protection of freedom of speech and democratic values has intensified in tandem with a sudden surge in attacks on secularist activists in the last two years. The 2010 establishment of a war crimes tribunal forced the country to grapple with its considerable lack of internal consensus over the role of religion in politics, and since 2013 eight bloggers have been violently attacked. Reports have emerged that prior to his murder Neel expressed his fear that he would be targeted to the police. According to Taslima Nasreen, the only assistance offered in response was the advice that he should leave the country. Contrast this with the prompt arrest of journalist Probir Sikdar just last week, who accused a cabinet minister of committing war crimes during the war for independence – it seems that the police are still on higher alert for the crime of “cast[ing] aspersion on a minister using information technology” than for taking action against those perpetuating the current bloodbath. Angry accusations that the government is pandering to hard-line elements within Bangladesh’s Muslim majority are becoming increasingly difficult to rebuff. The roots of this recent escalation are complex, and heavily related to the Pandora’s box of carnage and instability clumsily unleashed by US and UK led intervention across neighbouring regions in recent decades. In a year in which Human Rights Watch has despairingly observed that “it can seem as if the world is unravelling”, these events form just a small part of the patchwork of instability, turmoil and bloodshed that has swept across the Middle East and parts of Asia and Africa. The GMA Blog seemed a fitting place to discuss these appalling attempts to silence expression of dissident views online. These events have been a stark reminder that we are lucky to be living in a place and time where we have the luxury to be able to take protection from this for granted – however, we should not be complacent, and should continue to challenge attempts to undermine this right wherever they appear. This may be in the guise of the UK Conservative government’s more-than faintly sinister counter-extremism bill at home, or further afield. 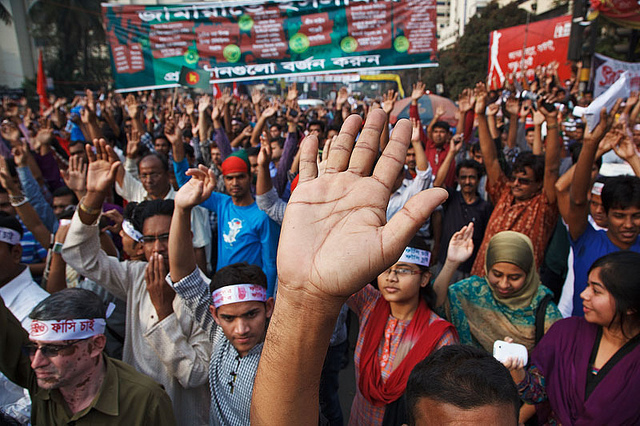 As many in Bangladesh are currently urging, it is not simply a case of whether the keyboard is mightier than the machete, but whether governments at home and around the world will begin to accord all their citizens the protections due to them, regardless of their political or religious affiliation. This entry was posted in Asia, Bangladesh, Freedom of speech, From GMA and tagged #freespeech, #GMABlog, #Islamism, #niloyneel, Bangladesh by BlogGMA. Bookmark the permalink. There are a lot of sound heads pointing towards the government as the perpetrator of these murders, playing on people’s prejudices and gaming the war on terror to maintain power. We need to learn not to be dogmatic about green serpents under the bed, especially when two government’s are in cahoots in regarding their own citizens and their fundamental rights to safety and fair hearing. UK citizens with deshi heritage are being caught in the cross hairs . LAst year, timed perfectly with a UN Security summit.